Greek mythology tells us that Achilles was a great warrior and was invulnerable except in his heel. When Paris, son of the king and queen of Troy, shot him in the heel, he was able to be killed. This gave rise to the expression Achilles' heel to indicate someone's weakest point. Common-ancestor evolution has a passel of weak points, and several of them are quite serious. Disclaimer: none. I bought Evolution's Achilles' Heels all by my lonesome, so I received no benefits for writing this here review. Just over a year ago, I gave a favorable review of the 96-minute documentary by the same name, and it's fitting that I write about the book as well. I reckon that because people are enamored with credentials and such, the good folks at Creation Ministries International didn't give scoffers the excuse of saying someone is "not a scientist" — the book has nine Ph.D. scientists, and the documentary ups the ante to fifteen. For the most part, the origins controversy is science-based, and it helps if you have a science background when reading this book. I seriously doubt that many people will read it with comprehension on a Sunday afternoon, as there is quite a bit of information in this paperback's 260 pages (not including the index). 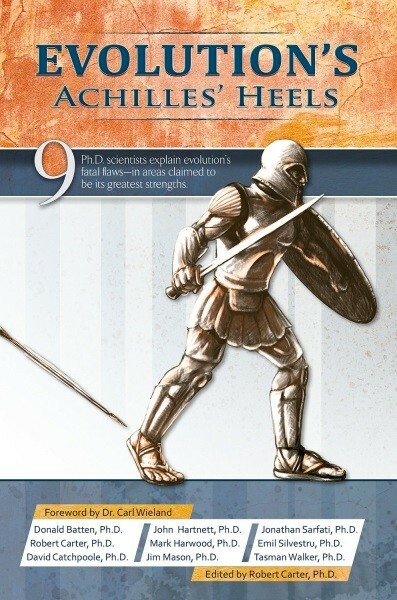 Evolution's Achilles' Heels has eight chapters divided into subsections and has many illustrations, mostly in color. The footnotes are somewhere around 500, primarily for supporting references, plus some URLs to CMI articles for further reading. It was good to see that the publishers didn't scrimp on paper, it's good quality my fingers didn't smear the ink. Here are the chapters, and some brief notes about the contents. Don't be getting the notion that the book's contents are superficial just because my comments are — we don't want this article to be excessively long now, do we? Darwin began his hypothesis that natural selection gave rise to wholesale changes from simple to complex life forms. The problem for atoms-to-author evolutionists is that, when properly understood, natural selection only refers to minor changes that do not add genetic information; natural selection is not evolution, but rather, a conserving process. Although evolutionists claim that DNA supports Darwinism, that's the opposite of the truth: DNA is hostile to evolution and friendly to special creation. "Junk DNA", repair mechanisms, genes and RNA, how genetics supports "out of Babel" rather than "out of Africa", and more are discussed. Previously, the chapters showed flaws in evolution by giving it a head start and presupposing a self-reproducing cell that has an operational genetic system. Although the typical Internet evolutionist will claim that the origin of life has nothing to do with evolution, that is both ridiculous and untrue. The origin of life is a huge problem for evolutionists — which is probably why they don't want to talk about it. Dr. Sarfati continues the progression that the other authors established, showing that the amazing complexity of DNA could not form or operate in the "primordial soup". Various chemical evolution studies have been self-defeating, showing intelligence involved in the formation of life's building blocks. Evolution proponents like to claim that the transitional forms that were missing in Darwin's day have been found, and are abundant in the fossil record. Fact is, transitional forms were missing back then, and they are missing now. Dr. Silvestru gives us definitions, some history about taxonomy and Carl Linnaeus. Biblical creationists expect to find evidence supporting the Genesis Flood, and the fossil record fits creationary models quite well. We are also shown several areas where fossils are "out of place" according to evolutionary thinking, and how the Cambrian explosion (the Cambrian is a very old layer that has the sudden appearance of fully-formed, complex life forms that have been preserved). From here, we move on to fossils that have "exceptional preservation", then what qualifies as a "transitional" fossil, false claims about transitions, living fossils, ape men, and more. The previous chapter discussed the fossil record, this time is the geologic record, which is "the arrangement of the rocks on Earth through time" (p. 155). When using the word "record", it's a mite misleading because it gives the connotation that rocks layers can be "read" in an orderly fashion to provide a valid history. Not possible. Dr. Walker provides a brief history of geology and uniformitarian interpretations, but the geological evidences does not require long ages. Fossils, finely laminated sediments, diamonds, opals, other rocks and geological features are shown to be able to form in much shorter periods of time than secularists demand; slow and gradual interpretations do not withstand scrutiny. In fact, biblical Flood interpretations provide far superior interpretations of geologic evidence. Evolution requires long ages, so when flaws in the dogma of radiometric dating are presented, village atheists and their Darwinist friends get very upset. Although there are several methods of dating the Earth, most give results that are supportive of the young Earth, so they prefer tendentious radiometric dating results. Dr. Mason presents the science behind radiometric dating, the accuracy of the processes, and the huge discrepancies in results. There are several major assumptions that need to be made when using radiometric dating, so scientists have proposed isochrons. Do they help? Although the isochron method is impressive mathematically and scientifically, it has serious problems as well. From rocks, the author rolls on to Carbon-14, and also radiometric dating using helium (which really puts burrs under the saddles of Darwinists). Although touted as science that is devastating to biblical creation, radiometric dating has some serious flaws and gives their views no credible support. When creationists write or post material refuting the Big Bang, it is not uncommon for critics to say, "What does this have to do with evolution?" (Yet, they don't make such comments when I post a picture of our Basement Cat on my Page, for instance.) This is a variation on the dishonest denial of, "The origin of life has nothing to do with evolution", since the cosmic origin of everything is directly related to evolution. Just do a search on "We are all star stuff", or, "Forget Jesus, the stars died so that you might live", and their variations. But I digress. 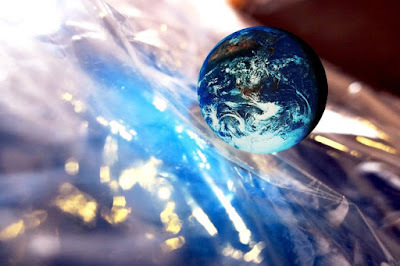 We have to begin with the modern history of cosmogony. It is not based on science, but is a philosophy that needs scientific support. Despite initial resistance, the Big Bang became the dominant cosmogony and cosmology. But it's loaded with difficulties, so the Big Bang has had to keep evolving (heh!) with numerous add-ons and tweaks. Dr. Hartnett discusses redshifts, Hubble's Law, the cosmological principle, and more. He points out that there are five evidences where cosmologists explain unknown factors by invoking other unknown factors. "The fatal flaw of the big bang model of cosmic evolution is that it is based on unverifiable assumptions, primarily the cosmological principle" (p.231). No, the Big Bang is not settled science, and most certainly does not support cosmic evolution. Here is the "why it matters" section. Atheistic materialism and evolution are inconsistent and irrational, and they do not want to know about that. Our worldviews (everyone has one) affect our daily thoughts and actions, but evolution-based morality is disastrous. People reject the God of the Bible, and their excuses really come down to the fact that they just don't like him. Misotheists present God as a big meanie in the Old Testament, but such thinking is based on prejudicial conjecture, ignorance of history and cultures, problems with semantics, and other difficulties that could be settled if honest people did their homework. This is not about reason, but about emotion and spiritual rebellion. (I have long maintained that if logic and reason were consistently used by unbelievers, there would be no conflict, because everyone would be a biblical creationist; it is the worldview best supported by science, logic, theology, and history.) Evolutionary worldviews lead to nihilism and despair, yet rebellious people continue to use fraud to bolster this belief system. In recent history, the mistreatment of native Australians, the Herero genocide, eugenics, and other evils were rooted in evolution. In fact, many people know that Hitler was an evolutionist and wanting to eliminate those that he defined as unfit, but World War I also had evolution as one of its causes. Famous atheist dictators murdered millions with their unrestrained atheism and evolutionary views. No, I am not saying that Hitler was an atheist, he had a strange religion all his own, and was a strong Darwinist. Even in more modern times, murderers such as those at Columbine and in Finland were evolutionists, and that was their motivation. And why not? Such teaching only leads to despair, and the violence of atheists and evolutionists is consistent with their worldview; there is nothing there to offer restraint for their actions. Biblical Christianity is a stark contrast to materialistic thinking. It is not just another code of ethics. There is hope and salvation in Jesus, and the scientific evidence supports not only recent special creation, but Scripture itself. No, theistic evolution and other efforts to compromise Scripture with evolutionary science philosophies will not work — they actually undermine the gospel message. People are locked into their rebellion against the Creator, and many are unwilling to consider the truth. In my preparation for writing this review, I saw an atheopath site asking for help in debunking Evolution's Achilles' Heels. One respondent offered a link to canned responses to creationists' claims. That's intellectually dishonest, old son. You want to debunk this book? Deal with the specifics, including the hundreds of supporting references. Also, they used the term "science deniers", a favorite of misotheists that is a logical fallacy, equivocating science with evolution. Then they call us stupid. As you probably expected, I recommend Evolution's Achilles' Heels for people who want to examine scientific evidence refuting evolution and affirming biblical creation. In fact, you would do well in purchasing both the book and the DVD (sometimes the two-pack is on sale). I'll go you one further. Both Creation Sunday and Question Evolution Day happen on February 12, 2017. My suggestion is to utilize that weekend to have your church stand up for creation and against compromise. Showing the video would be excellent, and reading the book would be a whole heap of helpful as well. You can obtain the book at CMI or search for other retailers. Evolution's Achilles' Heels is available at various locations, and in e-book format. Although I appreciate the advantages of e-books, unless you can view images in color and full-size, I recommend the physical book. Besides, underling an e-book reader is bad for it.